John French graduated from massage school in 1997 and opened a private practice in Seattle, WA. He became licensed in Florida in 1999 and moved his practice to Gainesville. In addition to private practice, he taught massage theory and technique at Florida Acupuncture and Massage Institute for several years. John played a strong role in Veterans receiving massage therapy in Gainesville and surrounding areas. In 2000, he created and worked in a program to help veterans with chronic pain by bringing massage into their homes. Shortly afterwards, he established an office in the Pain Clinic at the Malcolm Randall VA Medical Center of Gainesville, where he worked for eight and a half years helping Veterans using his extensive experience in injury treatment. 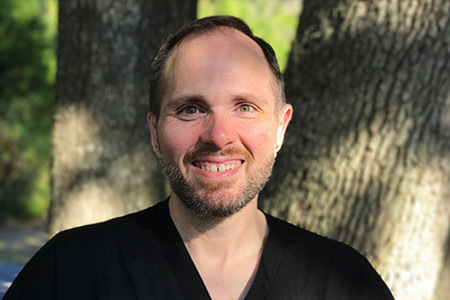 John is strongly involved in his local massage chapter (The Suwannee Valley Chapter of the Florida State Massage Therapy Association) and was Chapter Executive Board Secretary from 2007 to 2010. He continues to expand his knowledge of massage and the body through continuing education classes and independent study. He is a registered practitioner of Ortho-Bionomy® and implements CranioSacral therapy, Kinesio Taping, and Deep Tissue techniques into his treatments, as well as offering other forms of bodywork.